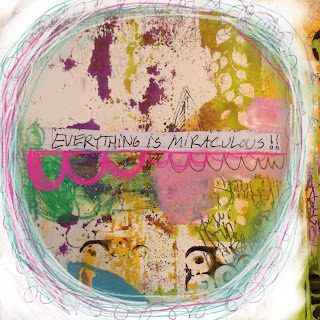 Mindy Lacefield: Everything is miraculous! Albert Einstein says "There are two ways to live: you can live as if nothing is a miracle; you can live as if everything is a miracle"
I hope you see the miracles happening every day around you. The minute. The ones you may have missed before. They are there. And once you learn to illuminate the little, you will find these things. They will start to feel that they are seeking YOU out. Manifesting in front of your eyes, you become one with all that is good. And the bliss you never thought you could have or thought you deserved is waiting there for you to take. Grab it in and hold close. Breathe in the essence and exhale out into this world the YOU that can now be shared. You will begin to inspire others. Meraviglioso, un mondo di visioni colorate! Nice Quote....What a smart man! Nice post and art, too! What is the pink paint in the upper right? That's such a powerful quote, and something I've been feeling over the past few weeks. I came over from Scrap Scene. Beautiful video. Love all the layers of color and the quote. Mindy you are always doing new things! I love that! I love how you are creating these art journal pages with the stencils! Is this in your dylusion journal? LOVE IT!!!! thank you for sharing your words. your spirit is such a bright one - so happy to be a part of your world! I love how the video shows that you painted over "See the beauty..." and changed it to the "See the miracles... in the minute and small." It's like there's a secret message underneath that only the viewers of the video know about. So wonderful, thank you for sharing that bit of art heaven with us!